Our Blocks & Drops make it possible to trim an entire room (or home) without making a single miter cut. The following pictures show some of the many ways our Mouldings are used. This pair of windows is trimmed with Moulding and Blocks. Click on photo for close-up and more information. Beadboard and Mouldings finish this small powder room. Click on photo for close-up and more information. Beadboard is used as wainscot in this bathroom also. Click on photo for close-up and more information. Casing and Blocks give this mirror a frame to call its own. Click on photo for close-up and more information. 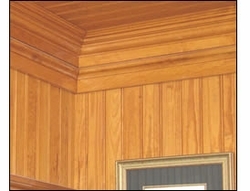 In this room, Crown Moulding is used to decorate the joining of the walls and ceiling. Crown Corner Drops make the installation a snap. Click on photo for close-up and more information. Base Blocks, Baseboards, and Baseboard Corner Posts give this office a professional and traditional finish. We used the rosette design from Corner Blocks #6 in a custom Keystone for the top of the curved Casing. Click photo for larger view. Casing and Corner Blocks at top of a bathroom window. Click photo for larger view. This Front Entry Door was given a lot of character with Head Blocks, Casing, and other Miscellaneous Mouldings. Click photo for more views. Door & Window Cap #5452n7 creates a very classic look over this window. Click photo for larger view. Our standard Mouldings and Plain Boards were combined for Crown Set #3. Click photo for larger view and details. Cap Assembly A combines several Mouldings and Cap Mouldings to create this beautiful Window Cap. Click photo for larger view and details. Our Crown Moulding, Plain Boards, and Nosing were combined for Crown Set #1. Click photo for larger view and details. 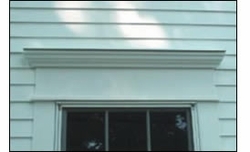 Polyurethane Door & Window Caps are a great way to add a finishing touch to exterior windows. Click to shop for mouldings, blocks, etc.